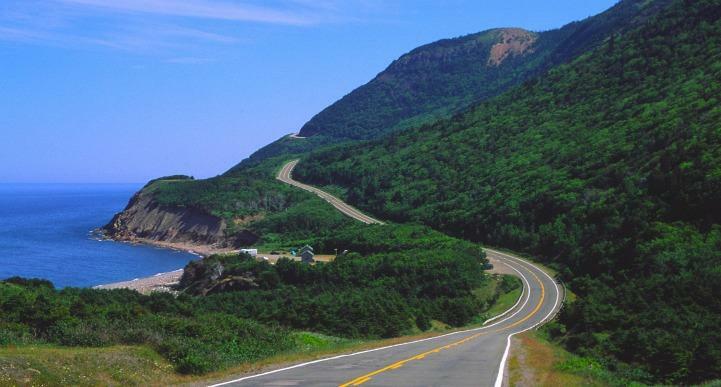 The Cabot Trail is a famous route which completes a long loop around the northern tip of Cape Breton Island. It is spectacularly scenic roadway, winding around and through the Cape Breton Highlands and offering vistas of mountain, ocean and coastline as far as the eye can see. An Cabot Trail road trip beginning in Halifax is an incredible experience, especially when done with all the freedom and flexibility of a motorhome, and will undoubtedly involve some breathtaking moments - do not forget to bring your camera. Clockwise is the preferred direction for trailblazers, for one simple reason - going that direction keeps you on the “inside” of the twisty road which often involves steep grades, curves and drop-offs. How long will it take you to drive the Cabot Trail? While the 298-kilometre trail can be completed in less than a whole day, you’ll need at least a couple to take it in properly. Add to that the journey to and from Halifax, a very nice drive in itself, and a week is probably the shortest amount of time you should dedicate to it. Pick up a Canada RV hire and #LetsGoMotorhome! Before you get going, take a few minutes to read about Canadian road rules and customs with our Canada driving guide, designed especially for motorhomers. Get acquainted with the beautiful - and somewhat wild - province of Nova Scotia on this first leg. It takes you from the province’s capital city, Halifax, to Port Hawkesbury - a town which lies just across the bridge from the mainland on Cape Breton Island. Skirt the upper reaches of the Bay of Fundy and head into the Highlands region, where the Scottish influence present throughout the province becomes even more noticeable. 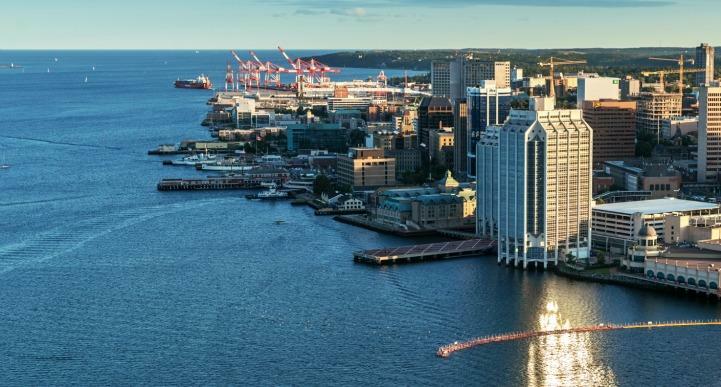 The natural harbour around which Halifax is built is the city’s lifeblood, and has been since it attracted first the Mi’kmaq people, then European settlers both French and English. In 1996, Halifax amalgamated with Dartmouth on the opposite shore and two other municipalities to become Halifax Regional Municipality which surrounds the waterway on all sides. 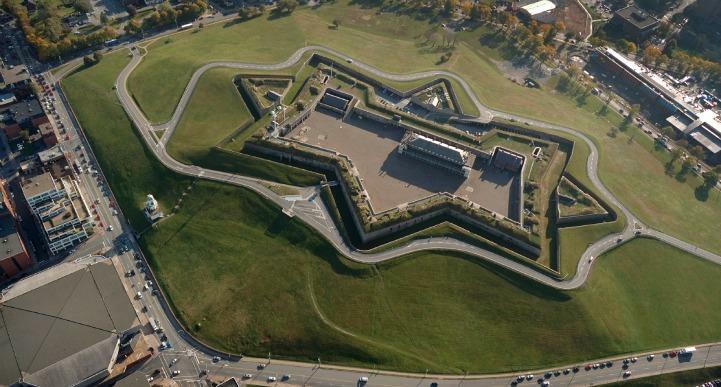 Strolling the downtown waterfront is a great way to get to know the area - or, climb Citadel Hill for a visual overview of the city and its harbour. Before you pick up your RV rental and make tracks, there are a few things worth seeing and doing in Halifax. At the top of aforementioned Citadel Hill is the Halifax Citadel, a Canadian Heritage Site and home to a museum and daily re-enactments in period dress. More history can be found at the Maritime Museum of the Atlantic on the waterfront, and close by that is the Art Gallery of Nova Scotia. Get a little lost in central Halifax and you will come across all kinds of eateries, shops and likely some live music. You could even take a boat cruise on the harbour, or the ferry across to the Dartmouth side. On a more sombre but very interesting note, the Fairview Lawn Cemetery in Halifax is where 121 victims of the Titanic disaster were interred - more lie there than anywhere else in the world. A third of the graves are marked only with the date of death and a number as they were never identified. Those travelling with kids will find plenty of things to do in Halifax. Older children will enjoy not only the Maritime Museum but the many other museums and heritage centres, a lot of which have free admission: the Shearwater Aviation Museum, the Scott Manor House Museum and Cole Harbour Heritage Farm to name a few. Younger ones will benefit from the many facilities that come with a sizeable city: playgrounds, public gardens and swimming pools. Murphys on the Water offers harbour cruises specifically geared towards littlies in an adorable “Theodore Too” boat, based on the character from the fictional “Theodore Tugboat” series. Once your motorhome hire is picked up and you’re ready to go, depart Halifax and head out amongst the vibrant green belt surrounding it towards Truro. 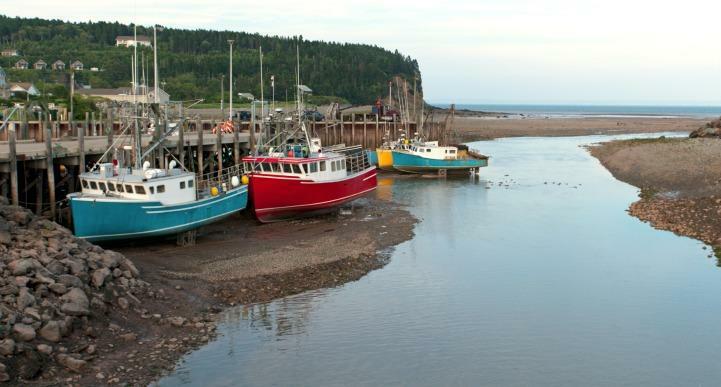 This small but centrally located municipality is often called the hub of Nova Scotia, and is a great spot to witness the famously huge Bay of Fundy tides. Check the tide charts and head to the Salmon River mouth to see the tidal bore sweep in like a wave, changing the direction of the river and raising the sea level dramatically. To experience it on a more personal level, consider a tidal bore rafting tour on the nearby Shubenacadie River - companies like White Water Adventures offer these exciting trips. The historic downtown area of Truro is also worth a visit, offering some nice boutique shopping, and if you are there on a Saturday morning don’t miss the Truro Farmers Market, very much a local tradition. The 400-acre Victoria Park is an amazing area of natural beauty in the heart of the city, featuring old growth forest, waterfalls, trails and more. Families will appreciate Victoria Park for its many child-focused facilities. There is not only a fun playground but also an outdoor pool, a picnic pavilion, a water spray park and waterslide. The next port of call along the way is New Glasgow, situated on a river which opens out into a natural harbour just like the old Glasgow. It also shares a very industrial history with its Scottish namesake, and is now a pretty riverside place which hosts a lot of summertime festivals. If you have time for a detour and want to hit the beach, try the Melmerby Beach Provincial Park which is 16 kilometres out of town and very popular on warm weekends. This lively town is the venue for the Highland Games every July, and home to St Francis Xavier University which was established by Catholic Scottish immigrants. Gaelic history is strong here, and you can learn more about it in the Antigonish Heritage Museum on East Main Street. The charming town is a nice spot for keen hikers to base themselves for a few days, as the surrounding region is replete with trails and beaches. Once past Antigonish, it’s a short hop along Highway 104 and over the Canso Causeway to Port Hawkesbury on Cape Breton Island. You’ll get onto the Cabot Trail proper during this leg of the trip which heads up the west coast of Cape Breton Island. Backtrack from Port Hawkesbury for a few kilometres before starting the journey north on the Ceilidh Trail. This town was first named Ship Harbour, and is a busy industrial town which serves as a service centre for the island. The Port Hawkesbury Community Trails are a 10-kilometre system of tracks beginning in the town and taking in the surrounding countryside, a great way to begin your Cape Breton Island adventure. The drive up the southwestern coast of the island will take you through the coastal plains and some very tiny communities - Creignish, Long Point, Judique which is home to the Celtic Music Centre, Port Hood, Mabou with its pretty Catholic church, and more. The coastline is replete with sandy beaches, so you can get some swimming in during this leg if you’re doing it in the summer. Take it slowly and enjoy the laid-back pace in this quiet corner of Canada. Keen bikers or hikers might be interested to know about the Celtic Shores Coastal Trail which stretches 92 kilometres from Port Hastings to Inverness. Well-maintained and suitable for feet, bikes, horses, quad bikes and even skiers in the winter, it can be travelled in its entirety or in short sections. There are more than thirty trailheads along the way, and highlights include coastal landscapes and wilderness, pretty rivers, beaches, fishing harbours and villages and the Red Shoe Pub in Mabou. One of the bigger towns on this part of the route, Inverness is a lovely place to stop and enjoy, with several eateries and cafes. 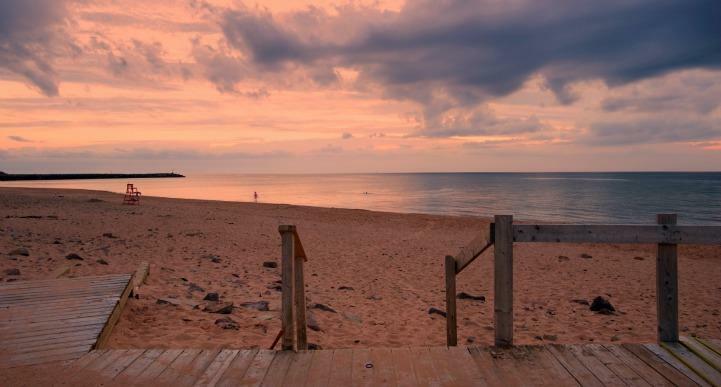 The campground at Inverness Beach Village offers you a place to park your RV up for the night should you wish to spend more time in the area - which includes Lake Ainslie, the largest natural freshwater lake in Nova Scotia. Continue up the coast, and once across the Margaree River you have officially made your first tracks on the Cabot Trail. This first section up to Cheticamp is quite different from the rest, a drive through flat and sandy territory with the mountains just starting to loom in the distance. This part of the route covers the majority of the Cabot Trail, so although you could drive it in 3-4 hours we certainly recommend allocating at least two days to take it all in. It’s also a good idea to drive slowly on the winding roads, and stop to enjoy the views rather than splitting your attention between that and the steering wheel. The busy fishing village of Cheticamp has charm in spades, much of it deriving from its Acadian heritage. Acadia was a colony of France which was established in modern-day Canada during the 17th and early 18th centuries, and included many members of the native Wabanaki Confederacy. The influence of this unique community is strongly felt in Cheticamp, from the Acadian French spoken by some residents to the local cuisine. Hooked rugs are a local specialty, and you can browse these at Flora’s Gift Shop which also sells souvenirs and ice-cream. Just outside of town at Grand Ètang, the Mi-Carême Centre is a small museum which explores the tradition of Mi-Carême, a traditional Lent carnival which was a major part of Acadian culture. The centre features displays, mask-making workshop, parties and more. If you’d rather get out on the water, try the Love Boat Whale Cruises which depart from the village. You can’t help but notice St. Peter’s Church when you drive into town. Constructed in 1893, it’s a beautiful building visible from all around Cheticamp and the surrounding area. It is often open to the public and if you are lucky there might be someone available to show you around and recount the history of the parish. The Plage St Pierre campground is a great spot to stay in Cheticamp, not far from the town centre and close to all the attractions. There is also a National Park campground called Cheticamp Campground which can be found just across the river. 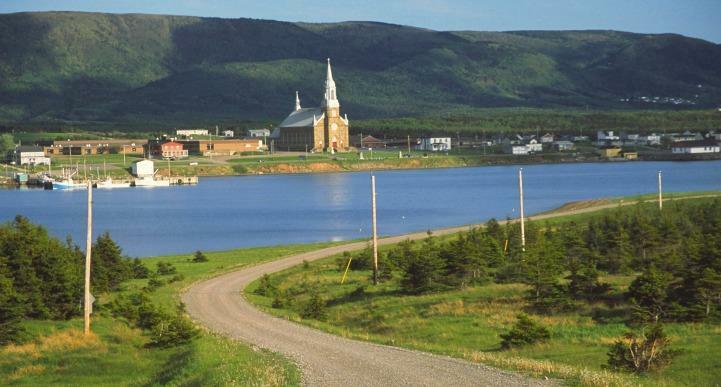 The Acadian Trail rises high above the Cheticamp River in an 8-kilometre loop, a great way to get acquainted with the area in a more adventurous manner, offering ocean and mountain scenery. Allow around four hours for this hike which is quite steep in sections and has some stream crossings. Note that passes are required for all use of the Cape Breton Highlands National Park, including hiking. This next part of the Cabot Trail is mostly just spectacularly scenic driving as you wind your way through the western edge of the Cape Breton Highlands National Park. If you want to get out and stretch your legs, or experience some of the amazing landscape under your own steam, the Skyline Trail is the place to do so. Keep a lookout for the trailhead not long after the road turns inland, around half an hour’s drive from Cheticamp. It is a seven-kilometre loop which is suitable for most fitness levels, featuring a boardwalk with steps and some easy hiking trails. The trail offers not only amazing views of the ocean and mountains but also an interesting glimpse at the Cabot Trail from above, and the occasional wildlife sighting. The road becomes very steep as you make your way down into Pleasant Bay, with lots of curves and switchbacks. This small town is known as the Whale Watching Capital of Cape Breton, and it is also a working fishing village - so try some seafood in one of the restaurants like the Mid-Trail, specialising in the local catch. You can take your pick of the several whale watching operators, should you wish to head out and see the amazing oceangoing mammals. 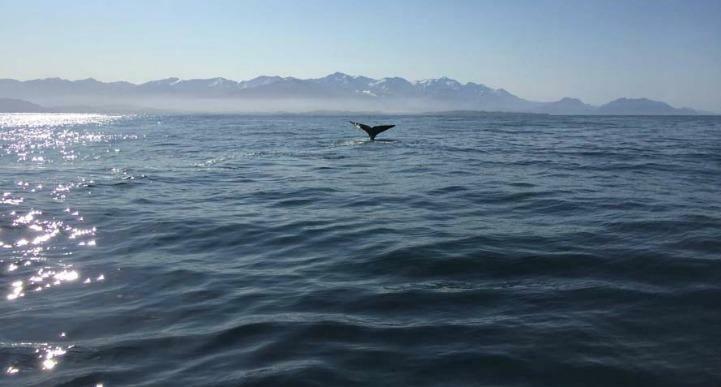 Options include Guaranteed Whales, Captain Mark’s Whale and Seal Cruise and Limbo Cove Whale Excursions - any of these companies will get you out on the water with a high chance of spotting whales. After Pleasant Bay the Cabot Trail returns inland for a spell, with a lovely drive through the Highlands to Dingwall and the surrounding area. You’ll have to make a slight detour off the main road to visit the town which sits on Dingwall Harbour - make sure to call in to the tiny St Paul Island museum and lighthouse on the way through for an informative and entertaining tour by local volunteers. The Cabot Trail is a little less hilly on its journey along the eastern coast of the Cape Breton Highland National Park, but still offers plenty of rugged scenery as you turn south towards Baddeck. 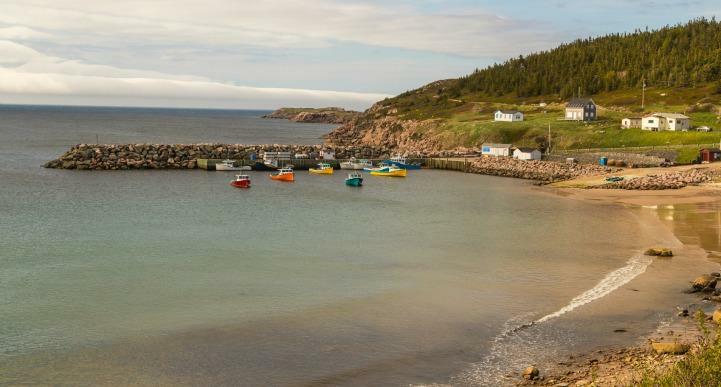 Ingonish and Ingonish Beach are your next destination, where you can break up the journey by stopping for a meal in one of the area’s restaurants or even for a night at Broad Cove Campground or Ingonish Campground. Hiking and the friendly local pubs are the main attractions here, along with the pretty Mary Ann Falls which are a short drive from Ingonish. 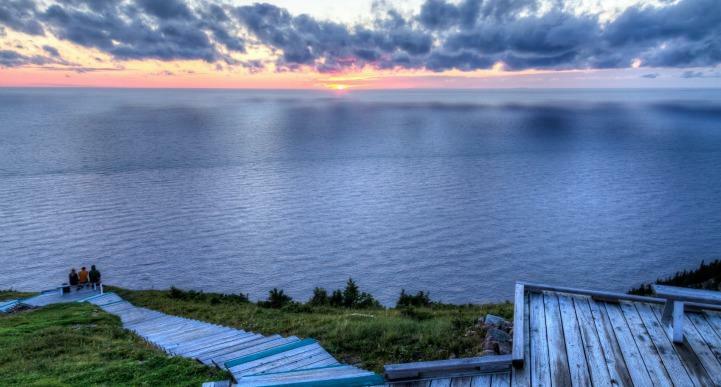 Cape Smokey Provincial Park, on top of Smokey Mountain just south of Ingonish, is a popular lookout and rest stop for travellers. Further south, you can continue straight along the road and take the very short $7 car ferry trip across the mouth of St Anns Bay to Englishtown, or turn off right to follow the official trail route around the bay. Children will likely enjoy the ferry trip, but older travellers might want to take the long way around St Ann’s Loop and visit the Gaelic College of Arts and Crafts which lies at the head of the bay. This fascinating institution contributes to the preservation of the gaelic culture and arts, and instructs in ten disciplines from bagpipes and bodhran to weaving and language. The official Cabot Trail ends after St Anns, where you turn right onto the Trans-Canada Highway 105 towards Baddeck. Although this return leg is no longer a part of the Cabot Trail, it still offers some great Nova Scotia vistas along the craggy coastlines and many small islands of the Eastern Shore region. At 5 hours, you can easily drive it in a day if you are in a hurry - but if not, take your time to explore. This town is often used as a travel hub for the Cabot Trail, especially those for who are planning to do the whole drive in one day. Located on the shores of the extensive Bras d’Or Lake, it is a pretty place and an ideal town in which to to stay a night or two and break up your journey. Many of Baddeck’s tourist attractions centre around the lake, where you can join a sailing tour onboard the two-masted ship Amoeba, rent a jet ski, cruise to Bird Island for some wildlife viewing or use your own armpower for a kayaking journey. 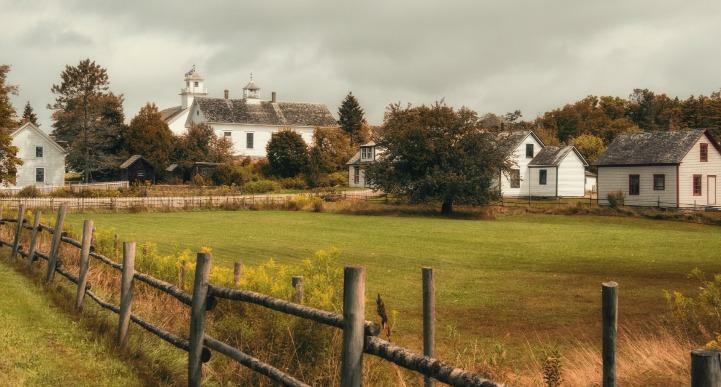 For some indoors fun, visit the Alexander Graham Bell Historic Site which has lovely grounds and a museum, overlooking the opposite shore where Bell’s summer house still exists in private ownership. 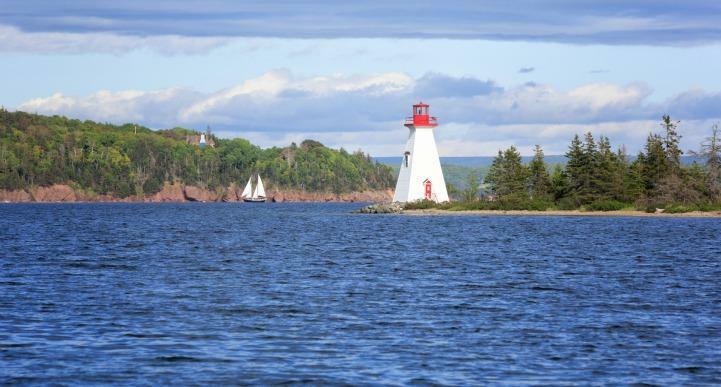 Depart Baddeck when you are ready to move on, and follow the Trans-Canada Highway 105 back through Port Hawkesbury and Antigonish before turning off onto Nova Scotia Trunk 7 towards the Eastern Shore and the many small towns strung along its ragged coastline. You might wish to walk the Liscomb River Trails at Liscomb, sign on for a scenic boat tour, swim at one of the many coves and bays or experience some living history at Sherbrooke Village. The numerous islands off the coast of the Eastern Shore offer the opportunity for adventure. A guided tour by sea kayak with Coastal Adventures is a fantastic day or half-day trip for those who wish to get up close and personal with the region - and if you are confident in your abilities, you can rent the kayak and explore independently. They are found in Tangier, and from there you can also visit the Tangier Grand Lake Wilderness Area. Before returning to Halifax you’ll pass through Musquodoboit Harbour, a rural community. It is home to a fascinating Railway Museum which displays the story of Nova Scotia’s railroads in a lovely restored station. The town also serves as a gateway to the Martinique Beach Provincial Park. 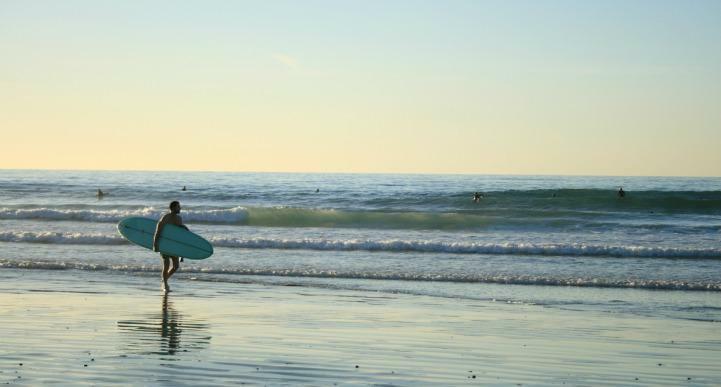 Possessing the longest sandy beach in Nova Scotia, it is popular amongst surfers and all other holidaymakers too, a great way to finish off your road trip before you arrive back in the city. Once back in Halifax, you can drop off your RV - or continue your road trip to see the rest of this peninsula province. Nova Scotia is an unforgettable place, with wide open spaces and wild coastlines to inspire the soul. Make the most of your time there!